How would you live your life differently today if you knew that no matter what happened, everything would be okay, even wonderful, in the end? Todd and Sonja Burpo's almost-four-year-old son Colton made an unforgettable trip to heaven and back during the darkest, most-stressed-out days of their lives. Times were tough, money was scarce, and the bills, frustrations, and fears were piled high. The story of Colton's visit to heaven changed their lives--and the book they wrote about it, Heaven Is for Real, gave new hope to millions of listeners. Now, in more than forty unique inspirational readings based on excerpts from their story, Todd, and for the first time ever Sonja, from her perspective as a mom, share what happened next--in their lives and in millions of others. Through their own experiences, and based on the stories hundreds of listeners have shared, they show you how believing heaven is for real helps us survive hardships here on earth, including the death of a loved one or the loss of a child through tragedy, miscarriage, and even abortion. The daily readings provide a powerful reminder that, beyond the hardships we may face in this life, God's incredible gift of heaven awaits us. Imagine being completely fearless on earth because you know that after this life you're going to heaven, and you know, really know, you're going to love it there. That's the promise heaven holds for us. Heaven is God's last word--and believing it's real changes everything. About "Heaven Changes Everything (Unabridged, Mp3)"
Todd Burpo is the pastor of Crossroads Wesleyan Church in Imperial, Nebraska (Population: 1,762) where his sermons are broadcast locally every Sunday via the local radio station. He volunteers at Chase County Public Schools as wrestling coach for Junior high school students, as well as serving as a member of the school board. In emergencies Todd can be found working shoulder-to-shoulder with the Imperial Volunteer Fire Department as a fire fighter. He is also the chaplain for the Nebraska State Volunteer Firefighter's Association. To support his family, Todd also operates a company called Overhead Door Specialists. Todd graduated from Oklahoma Wesleyan University in 1991 with a BA in Theology. He was ordained in 1994. Sonja Burpo is a busy mom and pastor's wife, and she works for a local real estate company. A certified elementary teacher, Sonja is passionate about children's ministry and helping women work through the difficulty of miscarriage. Customer Reviews For "Heaven Changes Everything (Unabridged, Mp3)"
I have previously reviewed Heaven is for Real and Heaven is for Real for Kids. I absolutely loved those books, and in fact I thought that Heaven is for Real was (and still is) one of the most amazing books I have ever read. 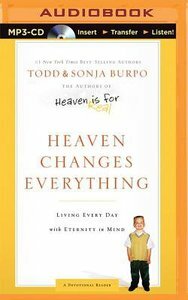 So I was very keen to read Todd and Sonja Burpo's book - Heaven Changes Everything: Living Everyday with Eternity in Mind. The basic message of this book is "How would you live your life differently today if you knew that no matter what happened, everything would be okay, even wonderful, in the end?" I enjoyed reading the account of what happened next (after the publication of Heaven is for Real) - in the lives of the Burpos. I especially enjoyed Sonja's account (since she doesn't write in the first book). However for some reason I found it really difficult to "get into" this book. Whether it was the repetitive nature of it (it quotes a lot from the original book), or it just wasn't what I was expecting, I am not sure. It's hard for me to judge whether someone reading this book who hadn't read the first one, would find enough here to satisfy their longing to know more about heaven. However it is a pleasant devotional, and one that reminds us again that, beyond the hardships we may face in this life, God's incredible gift of heaven awaits us. Heaven isn't just an idea, it is "for real" and you're going to love it! Disclosure: I received this book free from the publisher through the BookSneeze.com http:BookSneeze.com book review bloggers program. I was not required to write a positive review. The opinions I have expressed are my own.